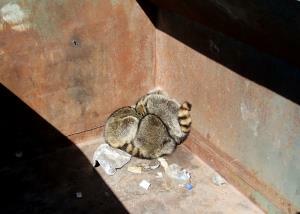 Found these three juvenile raccoons, huddled together and very scared, in an empty park dumpster. Put a big branch in and went on my hike since I couldn't coax them out. When I finished my hike, I was happy to discover they had vacated. Watch Where You Throw Your Trash!